Dr. Kinon is Assistant Professor of Neurological Surgery and Director of Spinal Education for the Leo M. Davidoff Department of Neurological Surgery. He is a New York native. He grew up on Long Island and then moved to Indianapolis, IN, with his family to finish high school. Dr. Kinon graduated with honors from the University of Chicago with a degree in computational neuroscience. He received his medical degree from Indiana University School of Medicine in Indianapolis, IN. After returning to New York, he completed his residency in neurosurgery at our Albert Einstein College of Medicine under the direction of Eugene Flamm, MD. 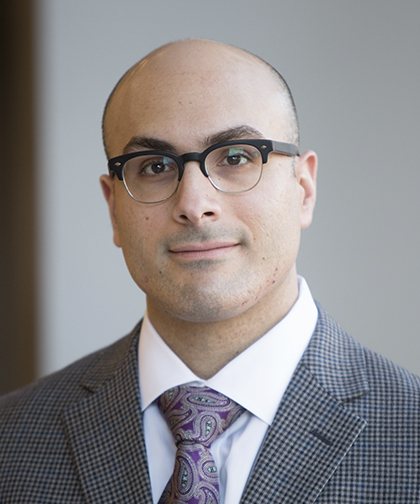 During his residency, he completed an enfolded fellowship in surgical neuro-oncology with Patrick LaSala, MD, focusing on the radiation treatment of central nervous system (CNS) neoplasms. After residency, Dr. Kinon completed a postgraduate fellowship in comprehensive adult complex spine neurosurgery with Carlos A. Bagley, MD, at Duke University Medical Center. Dr. Kinon has presented at many regional, national, and international conferences on various aspects of the surgical management of spinal disease. He has a number of publications on various topics of expertise related to neurosurgery and spine surgery, in particular. He is an invited peer reviewer for several journals, including World Neurosurgery and Surgical Neurology International. He is a member of the American Association of Neurological Surgeons (AANS), the Congress of Neurological Surgeons (CNS), the AANS/CNS Joint Spine Section, the North American Spine Society, AOSpine, the New York State Neurosurgical Society and the American Medical Association. As Director of Spinal Education for Montefiore’s Department of Neurological Surgery, he takes great interest and pride in medical education. He actively mentors and teaches residents and medical students. He holds weekly didactic conferences and monthly journal clubs to discuss the latest research and surgical techniques related to spinal surgery. Dr. Kinon also works closely with both Albert Einstein College of Medicine and Montefiore through a mentoring program for underrepresented and/or economically disadvantaged high school and undergraduate students that offers students a unique opportunity to become exposed to the medical profession.